The Archimedes Plasma Mass Filter is a plasma based separation technique. The main purpose of this device is to separate high mass and low mass elements within radioactive waste. 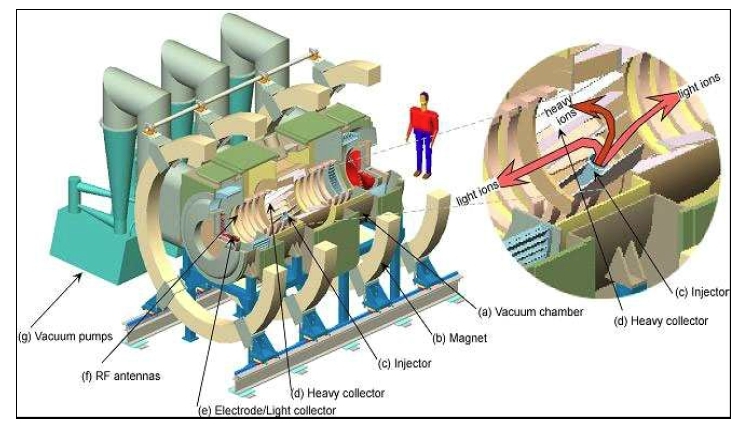 The device has a axial magnetic field and a radial electric field used to produce plasma rotation. Elements above a “cutoff mass” are ejected to the wall while everything below remains on the axis to be collected on the edge of the machine. The Archimedes Filter Plant is a facility that utilizes Archimedes Filter Technology to minimize the quantity of radioactive waste that must be vitrified. Current methods of processing nuclear waste can't separate the large amount non-radioactive elements. Vitrification is an expensive and difficult procedure so separating out as much non-radioactive material is very beneficial. The AFP is a system that is designed to separate all atoms below a controllable mass cutoff. The mission of the AFR is to have a system that can be run remotely and doesn't require any other waste processing systems to perform its task. The Process begins with all the waste being injected into the waste feed system as homogeneous slurry and small batches are periodically pumped into the feed adjustment system. In the feed adjustment system sodium hydroxide is added to the slurry until it is 50% NaOH by weight. Carbonates are removed in this step as well. The adjusted slurry is pumped into the plasma calcination system. This system rapidly heats the slurry to a temperature of 500 degrees Celsius through the use of a plasma torch. This allows all of the aqueous materials to be burned off. The water vapor and other gases are processed to remove radioactive materials and the excess non-radioactive gases are released through a stack. The slurry that was pumped into the plasma calcination system is now a caustic melt and is pumped through the filter injector system. 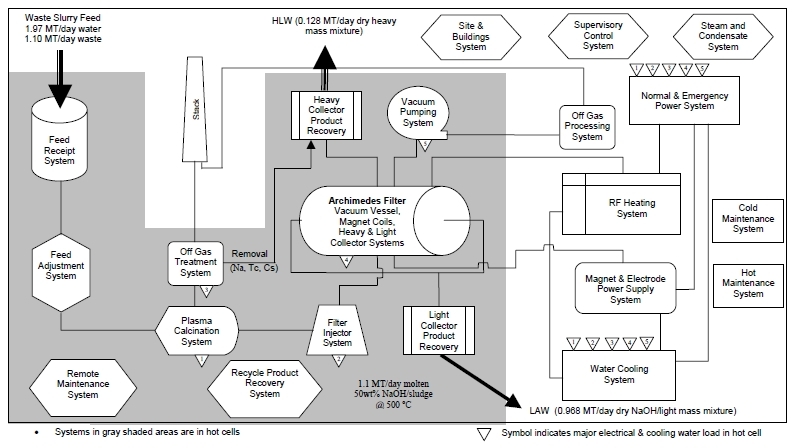 The filter injector system uses an inductively coupled plasma (ICP) torch to vaporize the caustic melt to temperatures of approximately 5000 ºC. At this point the vaporized waste is injected into the Archimedes Plasma Mass Filter. The Archimedes Plasma Mass Filter releases the light ions as a caustic melt mixture and is sent to the Light Collector Product Recovery System. At this stage the light ions are processed in accordance with the Low Activity Waste (LAW) requirements. The heavy ions are collected as aqueous slurry and are stored until it can be sent to a High Level Waste preprocessing facility. The rest of the AFP system supports the operation of the plant by supplying electricity, heating, and cooling elements.